The Boston Globe calls Syncopation "the 21st Century Manhattan Transfer or Lambert, Hendricks and Ross" and it is easy to see why. Like those legendary vocal groups, Syncopation performs jazz and pop music in four-part harmony with a style that is both timeless and up-to-the-minute. As an added treat each of the singers also plays an instrument or two like trumpet, trombone piano and percussion providing the excitement of a band much larger in size. 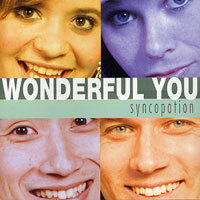 You may have seen Syncopation on WBZ-TV singing with the Boston Pops on their 4th of July Fireworks Spectacular (2009). The group often performs with instrumental accompaniment of piano, bass and drums, but they are equally renowned for their a cappella singing, which has earned them regional and national awards from Harmony Sweepstakes. Mixed Vocal Jazz quartet Syncopation represented Boston well at the recent Harmony Sweeps Finals in San Rafael, CA, winning a strong ovation from the sellout crowd for songs like the sweet, soaring "High and Dry," which is here on "Wonderful You." There are 9 songs here, our favorites are the a cappella songs, Joni Mitchell's "Both Sides Now" and the aforementioned "High and Dry." Of the others, "Invisible War," lightly piano-accompanied, is very nice, as are the more heavily accompanied songs "Breakout," "I Can Fly," the title tune (from The Big Chill), Lennon/McCartney's "Broken Wings" the Motown tune "Betcha By Golly, Wow" and "Getaway." Beautiful leads, harmonies and arrangements, but let us once again make it clear that "Wonderful You" is mostly an accompanied album.